Kim Corsaro, editor and publisher of the Bay Times weekly unloaded her ire in no uncertain terms with the Human Rights Campaign and their guy to replace District 8 Supervisor Bevan Dufty, Scott Weiner. Of course, I approve of such truth-telling and wish we had more of it from the gay print media and bloggers. Apparently, the president’s words were newsworthy enough for journalists to explore but a nonevent for our LGBT advocacy organizations like the Human Rights Campaign and the National Gay and Lesbian Task Force. Fascinating. Some of that political malpractice was enabled by the journalistic malpractice of Kerry and her editorial bosses. The malpractice she describes truly flourishes when the gay press serves as a co-dependent enabler. Let's unpack some of this writing. What she calls finger-pointing, I define as demanding accountability. She's not written about it because it was beneath her as a gay reporter, I guess, but now she says the mess before her eyes is political malpractice. Um, those of doing that finger-pointing have said this. The Advocate and Kerry have nicely enabled HRC and NGLTF and now crocodile tears are being shed by the publication, and I'm not impressed. What would I would laud is if Kerry, after the Democrats and their minions at HRC and NGLTF lick their wounds on Tuesday, stops serving as a placated lapdog turning up her nose at finger-pointing, and develops some decent watchdog skills. In the summer of 2008, HRC held their annual fundraising dinner at a Union Square Hotel in San Francisco. Hundreds of members of the San Francisco GLBT community picketed the dinner – a picket line that was officially sanctioned by the San Francisco Labor Council. [...] But Scott Wiener, board member of HRC, despite being urged to resign his board position in protest, as many others did, crossed the picket line in full support of HRC’s policy. If this Bay Times editorial by Corsaro isn't an act of class warfare, I don't know what is. An article in the new edition of San Francisco magazine that just hit the newsstands and web, is the scariest thing I've read this political season. Lemme try and boil down the essentials to explain what's happening right now regarding the mayor's office. Our current mayor, Gavin Newsom, is trying to become the state's lieutenant governor in Tuesday's election and his odds look pretty good for capturing that office. If that scenario plays out, and he's soon off to Sacramento, then the Board of Supervisors must choose an interim replacement for mayor. However, this being San Francisco, and being in un-chartered electoral and municipal territory, it is not quite clear if the current Board of Supervisors, a few of whom are being termed out this year, would decide on the replacement or if the new Board of Supervisors would get the king- or queen-making opportunity. Once it's agreed which Board will do the choosing, the Supervisors then have to find common ground about who to install in Room 200 at City Hall. That's the mayor's suite overlooking Polk Street and Civic Center. Now comes the frightening part. San Francisco magazine sees a convoluted series of plays and deals that could put Speaker of the House Nancy Pelosi in at Room 200. That scream you just heard was this queen reacting in horror to such a possibility. I say no to Pelosi as our mayor! The last thing our great city needs now is Pelosi giving up her Congressional seat and returning home to rule as mayor. Conservatives will be shocked to learn that in her backyard, Pelosi is not widely viewed as truly representing our core liberal to progressive values. She's all sizzle and no steak on pro-peace politics, gay rights, ending the AIDS drug waiting list crisis, preserving the environment and other important local concerns. Pelosi is from San Francisco, but her real constituency has been her more rightwing House colleagues. Yesterday, when I was looking at the financial info for NYC's God's Love We Deliver, a hot-meals program for people with AIDS and others, I checked out the same info for San Francisco's Project Open Hand (POH) agency, which also provides food services to PWAs. The POH site has a page devoted to 20 important questions related to their work, and it talks about their 501c3 tax exemption from the IRS, but omits mention of the IRS 990 form it must file annually. However, on their About Us page they do post their latest IRS 990, and I laud them for making the most current filing available, but also call on them to make three years' worth of 990s for public inspection. Tom Nolan, the executive director of POH, received $232,045 in pay for 2009, which is slightly less than the $248,200 he was compensated in 2008, and that was a huge jump up from his 2007 pay which was a relative paltry $184,585. Revenue for those respective years was $10.3M, $10.2M, and $10.9M. Nice to see an AIDS Inc director sacrificing a small amount of his pay in these difficult economic times, but his take home salary is still sizable. In comparison at DC's Food and Friends, CEO Craig Shniderman's latest pay comes to $334,000, and NYC's God's Love We Deliver is compensating their executive director, Karen Pearl, a healthy $310,000. Clearly, the top honchos at these meals-on-wheels programs are not about to starve. In the case of Nolan, I must point out that after working a forty-hour week at POH, he has so much time on his hands he is able to serve as chair of the SF Municipal Transportation Agency board. I blogged about Nolan, his POH pay and service to the SFMTA last year, and he gave me a written explanation about the few hours he puts at the transit agency. Today, the secretary to the SFMTA board of directors, Roberta Boomer, told me on the phone that she spoke with Nolan about his time commitment to the agency, and the weekly hours remain the same as last year - way under ten hours. The salaries of these and all executive directors at AIDS Inc and Gay Inc orgs, along with the most up-to-date IRS 990s, should be an integral part of community-wide discussions about the groups, their missions and stewardship of their dollars. HRC's Marty Rouse Lobbies a Door? While over $1 million will ultimately end up being spent in this top-tier race, it is the face-to-face contact with voters in the final days leading up to Election Day that have the best chance of winning over the remaining undecided voters. There is nothing more empowering in our democracy than talking face-to-face with voters in a tight race. With such an emphasis on getting up close to an actual voter, you would expect HRC to use a photo of Rouse engaging face-to-face with a person, right? Clearly show him and the voter, too. Yeah, well guess again. Even with a 17% drop in revenue this year, can't HRC afford to hire an assistant who knows how to take a simple and effective photo, showcasing the $184,600 national organizer, speaking to a voter? 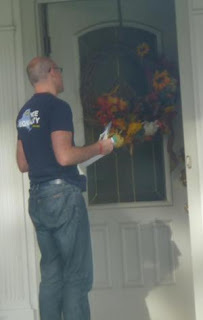 I'm not sure how the HRC blog editors let this picture get up, when it's fuzzy, doesn't contain Rouse's face, and shows him addressing a door with a seasonal wreath on it, and not a single voter in the image. From small stuff like this, to the larger problem of HRC is beholden to the Democratic Party at the expense of the gay community, the org deserves every woe and critical attack on its leaders and their incompetence. Curios that Rouse's post said not a peep about HRC's special adviser Brian Ellner, who was hired in the summer to head up the org's New York State affiliate the Campaign for NY Marriage. We'll learn in little more than a week if Ellner's strategy pays off for Democrats running the show in Albany. As I read the New York Times' coverage on Saturday about the huge document dump of files from the U.S. war in Iraq, I thought about Duncan Osborne, reporter for Gay City News, and wondered if he would pore over them. You may recall he broke the story last year about the State Department knowing of the killings of homosexuals in Baghdad in 2006 and 2007, and the department did little more than create talking points for its spokespersons. How did Osborne get his story? The old-fashioned way - he filed a Freedom of Information Act. He should give lessons to other gays in how to use FOIA requests to shed light on our government and gay matters. Let's give the man due credit for prying loose that awful news from the State Department, and now for digging through the voluminous files posted on Wikileaks.org. Do you know of any other reporter or an activist who took the time to search the files? I don't and I think Osborne deserves much praise for bring new anti-gay atrocities in Iraq to our attention. I've excerpted just the opening paragraphs to his latest story on the killings, and I hope you all will take the time to read his piece in full. After that, please post something to your blog about Osborne's story, or share the link to it far and wide. A 2005 document included in the nearly 400,000 US Department of Defense records recently posted on wikileaks.org shows that the Pentagon was aware of the organized killing of gay Iraqis more than 15 months before those murders were first reported, in Gay City News. “The male was shot (___) times in the chest, and a note was discovered on the body stating that the man had been killed by ___ for stealing cars and being homosexual,” read the January 1, 2005, memo, in which some words were redacted. The body was discovered in Ramadi, a city in central Iraq, and a note was left at the scene by the gunmen who killed the man. The fact that the note was written in advance of the killing suggests that the gunmen knew whom they were targeting and why they were killing him, and had time to plan and prepare for the murder. In the perfect world, Equality California would maintain and grow the field program it has built, both to be ready for a possible court loss and to continue building public support. However, in the present economic climate, where there’s a real sense that Prop 8 could be overturned in the courts in the next two years, the funding is simply not available for EQCA to maintain the program it has put in place. This means EQCA needs to make some changes, and it is. EQCA is maintaining a solid marriage program, with the Let California Ring public education campaign at the center working to devise and disseminate messaging that will continue to grow support, both across the board and in target communities. [...] At the same time, after the November elections, EQCA is significantly reducing its field staff and is closing some of its offices. Fascinating news, coming only days after learning the Human Rights Campaign's revenue for 2010 is down by 17%. Maybe these Gay Inc org will finally get around to respectfully engaging the community with regular open meetings, streamed on the web. In the process they may develop genuine grassroots support, another democratic component sorely missing from EQCA and HRC. However, if homo-history is any indication, the funding crisis at Gay Inc entities will likely be wasted and not used to improve the orgs. Remember all the anger and street protests after Prop 8 was lost, and the short-lived Join the Impact sprouted a web site? Lots of thought JTI would bring Gay Inc to a new place of transparency and accountability. But then JTI attended the NGLTF's Creating Change conference, got co-opted, and was neutralized. Anyone heard from JTI Amy and Willow lately? Will the gays learn again, as we did in the 1980s, how to make effective use of a crisis? Three co-hosts of the hit day-time talk show The View pledged a total of $15,000 to God’s Love We Deliver on Wednesday, October 27, 2010. Joy Behar made the first bid to her “favorite charity”. Inspired, Whoopi Goldberg and Barbara Walters also promised to pledge $5,000 dollars each. GLWD is a worthy charity providing an essential direct service to thousands of folks in need, and I hope they put the $15K to use feeding people, and not executive salaries or overhead. I've checked two sources for info GLWD's president and CEO, Karen Pearl, and the Charity Navigator site lists her compensation at $310,000. That is a bit higher than what is reported in the org's latest IRS 990 filing for 2009, which lists Pearl's pay at $287,288. The revenue was listed at $8.6 million. Pearl's compensation is in league with that of Craig Shniderman, CEO of the Washington, DC, based Food and Friends org, with a similar mission. Shniderman's current pay is $333,857. Their current revenue figure is $7.1 million. Two emails were sent to GLWD's media rep, David Ludwigson, along with a voice mail message, asking for clarification regarding Pearl's compensation. He has not provided me with a reply, but if he does, I'll amend this post. Stock Photo of Models: Real Gay Youth? Maybe it's just me and the fact of where I live, but I see honest-to-goodness genuine gay youths every day in the Mission, or on the web. It's not difficult at all to locate gay young people, if you really want to find them, right? Two Astroturf gay orgs currently use the same stock photo of perfect slender, multi-racial young models in a most seductive pose on their web sites, telling me these orgs need to exercise some muscle and shoe-leather, and pound the pavement to find actual gay youth. Not a single chub, nerd, baby dyke, gawky kid among the models. How reflective of authentic gay lives is the image? Over at DC's Gay and Lesbian Activists Alliance blog, Rick Rosendalls informs us that openly Democratic and gay political guru to Barack Obama during the 2008 campaign, Steve Hildebrand, is a top leader at the niche gay org known as Faith in America (FIA) and they've redesigned their site. FIA is a 501c3 tax exempt org, founded by gay furniture mogul Mitchell Gold in 2005, and Gold's business is a longtime corporate sponsor of the Human Rights Campaign. He also likes to throw a lotta money at the Democratic Party and its candidates. Further, the HRC Foundation's 2010 IRS 990 filing, on page 29, reveals that they donated $25,000 to FIA, making this all quite a comforting circle jerk, politically speaking. Why can't these orgs show us their gay youth members or any everyday gays? Actually, I shouldn't presume that the models are gay, but I do presume that gay orgs such as FIA and GetEQUALNow! have a responsibility to showcase not only authentic young same-sexers in their imagery, but also in the ranks. But if that is too much to ask of them, can the orgs at least use different stock photos? After a week of pure obstinacy for no good reason over my public records request for their 2010 IRS 990 filings, the Human Rights Campaign (HRC), finally complied with federal law and made the HRC filing, along with the one for the HRC Foundation (HRCF), and their hot-off-the-presses annual report available for public inspection on their web site. My hunch is that because of the bad news about plummeting revenue, HRC wanted to wait as long as possible before allowing prying eyes to view the documents. The documents were published earlier today. Let's go over the highlights of what's in the three documents made available. 1.) The annual report shows that revenue for 2009 was at $45,792,310, and for 2010 it was $37,918,133. The difference comes to $7,874,177, which is a drop of 17%. The lousy economy certainly played a role in that steep fall, but my gut also says a significant portion of the decline is due to more gays not donating to HRC. The committee's findings were presented to the full board, which adopted its findings in March of 2009. The same committee described in 15A that examined the president's compensation also looked at the current compensation of the organization's officers and key employees. The same set of materials and procedures were used to assess the compensation of the officers and key employees, and minutes were kept of the meeting. The findings were presented to the full board, which adopted its findings in March of 2009. So the decisions to keep Solmonese on for an additional two-years and to hold executive salaries at 2008 levels were made more than a year-and-a-half back, but we're only now learning it. Frankly, this information should have been made known to the community in March 2009, because HRC owes us more comprehensive transparency about its changes at the executive level. I find it curious that top salaries didn't fall 17%, as did revenue. Heck, they didn't drop one bit, showing no real sacrifice on this front from Solmonese and colleagues. Maybe they cut programs 17%, to deal with the shortfall? HRC continued broad-based efforts to build support for a fully-inclusive ENDAby creating the Business Coalition for Workplace Fairness, hosting 300 clergy members in Washington, DC, for Congressional lobbying, coordinating in-district lobbying by 1,000 HRC members and educating and training faith communities about gender identity issues in priority districts. How pathetic is it to tell the IRS that your org has hundreds of thousands of members, and you can only persuade 1,000 of them to engage in local lobbying of their House and Senate representatives? Very pathetic admission on HRC's part. 4.) Solmonese still flies first-class on occasion. Whatever the salaries or annual revenue, the Human Rights Campaign is still the Worst.Gay.Group.Ever. I'm looking forward to watching if other gay and progressive bloggers, or straight and gay media, pick up on the release of the documents through my request to HRC. We need lots of eyes going over the HRC IRS 990s with fine tooth combs, and for the org to explain the serious plummet in revenue and how it affects their agenda and operations. After being lied to by HRC executives, and their failure to comply with federal law about IRS 990s being made available to the public, I've decided to request an IRS investigation. All gays should be aware that HRC's most current tax filing was ready for public inspection almost three months ago, and the org has chosen to not inform the community of this fact. HRC must be made to understand the law requires them to freely share their tax filings, and right now, they are violating IRS law. Let the sunshine in! I wish lodge a complaint against the Human Rights Campaign (HRC), Employer ID # 52-1243457, and its affiliate the Human Rights Campaign Foundation (HRCF), Employer ID # 52-1481896, and demand an immediate investigation into their failure to meet IRS law requiring public disclosure of their 2010 IRS 990 forms. Both exempt organizations accepted their 2010 IRS 990s from their accountant the week of August 2010, which was confirmed to me in a telephone conversation on October 15, 2010, by the organization's treasurer Mr. James Rinefierd. He also confirmed that his organizations were required by IRS law to make the 990 filings available for public inspection on the day they were accepted in August. I informed Mr. Rinefierd that on October 15, 2010, I had emailed him a written request for the 2010 IRS 990s, and also made a verbal request for the filings. He promised his organizations would comply with my request. Thank you for your email. We are in the process of preparing copies of the 990’s for posting on our website. Our plan is to post them by the end of the week and will inform you just as soon as they are on line. Michael – I do very much appreciate your patience. We’re working on getting them posted and will certainly let you know as soon as they’re up. Unfortunately, HRC and HRCF has not complied with public disclosure of their 2010 IRS 990s, either by sending them to me via email in electronic format or fax machine, nor have they kept their promise to post the filings on their web site. Therefore, with such willful and flagrant non-compliance of IRS law requiring public disclosure, which HRC and HRCF could have easily done on their web site way back in August, I am formally request a full and impartial investigation into their failure to make their 2010 IRS 990s open for public inspection. Please contact me if you have any questions or need clarification. I can be reached at 415-621-6267. My email address is MPetrelis@aol.com. Dana Van Gorder lives in Emeryville. For the past two decades he has not paid taxes or voted in San Francisco, where he is not a resident. Click here and here for verification of his East Bay residency. And the fact that he doesn't live here is omitted from his latest letter to the Bay Area Reporter this week, about the race for the Castro's seat on the SF Board of Supervisors. With the letters, our general policy is that for executive directors of organizations, I list their title and agency, as I did with Dana this week. Other examples of that, from a quick review I did, include the executive director of the Castro CBD (letter 7/15/10); Milk Club leaders' letter (8/26/10); PAWS President letter (9/23/10). Okay, but why not add two things, Emeryville and CA, to Van Gorder's letter? And why exempt executive directors from providing their city of residence when getting a letter published in the BAR? In other words, have a policy that applies equally to all letter-writers. Prior to becoming leader of Project Inform, Van Gorder was the key mover behind the SF gay community center. During his tenure as gay liaison within the SF Department of Public Health, his main goal was the center, even though there was little clamoring for one. "Queer youth and newcomers to San Francisco need a rich resource to help them build community in healthy ways," [Van Gorder] wrote. "In study after study, gay men, at least, describe their feelings of isolation and a lack of a sense of community. And yet the center is always somewhat starved financially in the midst of enormous community assets." The BAR omitted the relevant info that he doesn't live here, yet he's a supposed expert on what SF gays need to build community. Allow me to digress and point out that Van Gorder, who as head of an HIV treatment org ought to know better, cites studies about the alleged isolation and other problems of SF gays that are the reasons why a center is needed. He has never produced _any_ these studies. "In a community like San Francisco's LGBT community with the resources, creativity, and needs we have, I am perplexed that people don't gravitate toward the center more to really help it to thrive," said Van Gorder. Again, the BAR leaves out a crucial factor: Van Gorder doesn't live here and really does not have the pulse of what local gays want. He and his A-Gay pals decided behind closed doors in the late 1990s that SF simply had to have a center, whether we wanted one or not. The project was more about Democratic Party patronage at the local and state levels. In 2008 San Francisco was swept up in a controversy over a Board of Supervisors member named Ed Jew, who among his many faults, actually lived in Burlingame, not the Sunset district. He not only broke residency laws for elected positions, but was also taking bribes and is now serving time in a penitentiary. It's just one more example of people who don't live in San Francisco having undue influence over local politics and programs for those of us who do reside here. The BAR should start to inform readers that Van Gorder lives in Emeryville, every time he is quoted or they print a letter from him about anything to do with San Francisco. At the same time, us locals should insist that only people who live, pay taxes and vote here be allowed to make important decisions about the direction of local issues. Vs $2.4M in Government Grants? The powers-that-be at National Public Radio earlier this week fired commentator Juan Williams, over anti-Muslim remarks he made on Fox News, where he is also employed as a pundit. Since he was let go, conservatives have been demanding that the government no longer subsidize NPR, an outlet viewed by the right as a liberal news outfit. You know me, when I'm curious about such claims of government grants to a nonprofit, I go and search their most current IRS 990 forms. To their credit, NPR officials post four years' worth of tax filings where grant info is located. Here's the deal on government money awarded to NPR. In 2005 it received $436,107, during 2006 it was $438,000, for 2007 the amount was $941,169, and in 2008 it was $634,165. The four-year total comes to $2,449,441 in government dollars. On the other hand, according to NPR's annual reports on donors and sponsors reveal parts of the Fox empire are large donors. The 2005 report shows 20th Century Fox Home Entertainment gave between $50,000 - $99,999. Unfortunately, NPR's annuals don't give precise figures, so for all amounts given by a Fox entity, I've settled on the middle amount of the widespread donation figures. For argument's sake, I'm saying the amount was $75,000. For 2006 Fox Searchlight Pictures was in the same ballpark, and I'm estimating it gave NPR $75,000. In 2007 20th Century Fox Home Entertainment and Fox Searchlight Pictures separately gave between $500,000 - $999,999, so I'm settling on the figure of $750,000 for each, bringing that year's Fox Inc donations to $1,500,000. And during 2008, Fox Searchlight Pictures gave between $250,000 - $499,000, and I'm guessing it was $350,000. The 20th Century Fox Home Entertainment outfit donated between $100,000 - $249,000, and I peg the amount at $200,000. Lastly, the Fox Broadcasting Company gave between $50,000 - $99,999, and my guess is that the figure was $75,000. For 2008 my estimate is that Fox Inc entities coughed up $625,000. The sub-totals of $75,000, $75,000, $1,500,00, and $625,000 add up to $2,275,000. That is just a tad shy of the $2,449,441 in government grants for the same four-year period. Maybe those calling for the government funds to NPR be cut should also demand that all Fox Inc outfits end their donations to the radio outlet cease. Bottom line: NPR and Fox Inc should provide the public with specific figures for donations from Fox Inc entities, so we can more accurately compare Fox donations with the government grant amounts. 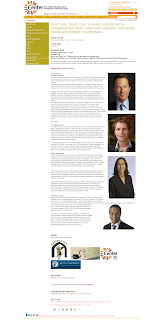 The meeting included Jim Kessler of Third Way, Aubrey Sarvis of the Servicemembers Legal Defense Network, Alex Nicholson of Servicemembers United and CAP's [Winnie] Stachelberg [formerly of HRC]. Nice, but I want all of the names. White House visitor logs show the other attendees were Joe Solmonese and David M. Smith of HRC, and Tobias Wolff, and that everyone showed up a little before 10 AM. Everyone left soon after 11 AM, except for Solmonese and Sarvis, who didn't exit the White House until shortly after 2 PM. Oh, to be part of a community where those folks would have stepped before a public gay audience later that night, and engaged a wide audience about what was discussed and agreed to. And what did Solmonese and Sarvis do for the extra three hours they were there? Knowing now the names of all the gays who were at the May 24 meeting gives me a fuller picture of how the Obama administration has engaged with professional orgs and advocates. Looking at the latest logs, Solmonese now stands at 32 visits, that's up one from the last time I searched. For his ex-HRC colleague Stachelberg, she now stands with 12, a jump from 5 listed back in May. Also doing pretty good for herself with White House access is HRC board co-chair Hilary Rosen with 14 visits, including one on February 24, with four others, and another on March 24 with Valerie "Lifestyle Choice" Jarrett, just the two of them. On February she was one of 6 folks to meet with Messina. NGLTF executive director Rea Carey has now been to the White House nine times. In March she attended two meetings with the next-to-invisible and so-quiet gay liaison Brian Bond, and there were 6 and 9 other attendees at those meetings. For public liaison, he's obscenely private. On June 3 she met alone with now-departed openly lesbian legal counsel Alison J. Nathan. As the number of visits by professional gay advocates rises at the White House, and we can see who attended a crucial meeting on DADT, I keep asking, what are average gay folks getting? How we benefit? May we soon find out via public engagement and town halls with the professionals who are trooping up to the White House on our behalf. A note of strong warning: If you want to search the White House logs, be prepared to get frustrated with the many steps necessary to search by name, then scroll up/down and left/right trying to grasp when meetings took place, the duration, who the person visited was. In my decades of drilling down for raw data, I can honestly say the Obama White House gets a passing mark for making the info available, and rather quickly too, but it seriously fails at being user-friendly. Click here to verify the above info, maybe search other visitor names, and see how piss-poor the White House performs with making the data easy to read. The horrific campaign of terror being waged on the gay community of Uganda took a higher-level of vileness recently when a local newspaper called Rolling Stone printed photos, locations and names of people alleged to be gay. Oh, it also wants them hanged from trees. This outing and lynch-mob effort seriously increases the risk of harm to the safety and security of all gay persons, or those perceived to be such, and the paper doing it has zero connection to the American magazine Rolling Stone. I was first made aware of this madness thanks to Jim Burroway and his Box Turtle Bullet blog. Ah, the bully of international gay human rights advocacy, known by some as an equal to Karl Rove in terms of dirty tricks and sock puppetry, Scott Long, the former director of gay issues at Human Rights Watch. Sure, I laud Rolling Stone for it message, but it must be taken to task for quoting Long as if he's still at HRW, or worth citing without referencing his controversial and divisive tenure at HRW. Then in late August, Long developed a severe case of a Soviet-style case of the flu and was dismissed by HRW. His official explanation for moving on would have delighted the editors of Pravda in Brezhnev's day, it was so full of obfuscation and self-pity. If the magazine needed a credible source on the hate in Uganda, the U.S. President's remarks could have been cited. Finally, let's discuss Rolling Stone's omission of any call to action from the president, the Obama administration or Democratic House and Senate leaders. Nice that the magazine is all upset, but why stop at a simple condemndation of what it rightfully says is one of the most vile homo-hating pieces they have ever set eyes upon? Wenner's FEC file shows that he's given at least $167,556 in the past two decades, to Democrats and their PACs, while heavily donating to Obama's 2008 campaign. I hope those donations are not the reason why Rolling Stone magazine has failed thus far to call on the American government to take action over the escalation of homo-hatred in Uganda. What Did GetEQUAL 'ENDA Summer' Achieve? All I know is that GetEqual specializes in direct action and protests against lackadaisical Democrats, including Pelosi and Obama, who talk the talk but stumble along the walk. They were originally funded to the tune of, what, half a million (?) by deep pocketed individuals, but they’ve gone through that bankroll and are trying to raise money from us, the hoi polloi of the gay community. Either they had no idea what was going on in Washington, or they needed an issue for their direct action and didn’t actually care whether or not such action would lead to the result that was trumpeted by the very name of the campaign. All in all, a pointless exercise that left me unimpressed. By the way, I just looked up ENDA Summer to find out when it started and saw that GetEqual sent “many thanks to the group of organizers who originally created the ENDA Summer campaign on Facebook and offered us their research.” So I guess GetEqual didn’t dream this up, but they picked it up from someone else, who for all I know may have started it back in March when it would have made sense. Sure, this is excellent news but I won't allow it to overshadow HRC's hard reluctance to voluntarily keep themselves transparent. As I wrote earlier this week, the HRC and HRCF 990s for this year became available back in mid August, and the org didn't bother to tell us, nor did they share the filings on their web site. Indeed, HRC presently doesn't share any IRS 990 filings on the site. 1. The orgs on their "About Us" pages must post at least three years' worth of IRS 990s. Orgs that already do this include DC's Food and Friends and Immigration Equality. 2. The day an org accepts the latest IRS 990 filing its accountant is the day the org should post the filing on its web site. There is no reason why HRC could not have done this back in August, and comply with the IRS law requiring widespread public availability of the 990s. 3. When the new IRS 990s are posted on the orgs' sites, they should also include an explanation of the budget, revenue and compensation packages for top executives. In other words, the orgs need to communicate with the community about the filings and show how they are meeting their goals of changing things for the betterment of the gays. After I forced GLAAD to share its 2010 IRS filing, the executive director shared a letter of explanation, shedding more light on its operations. 4. Each org must hold an open forum with the community to not only explain what all the numbers and breakdowns mean, but to also take questions from ordinary gays who have a stake in how the orgs manage their funds. While some will complain that HRC is about to receive a small amount of attention for the release of the new IRS 990s, probably late on Friday afternoon, about ten days before the mid terms elections and the info contained therein won't get the proper widespread scrutiny the filings deserve, I have to agree with such criticism. If we want more timely public sharing of the IRS 990s from Gay Inc and AIDS Inc, it's going to take more bloggers and activists to demand it. As we all can see, right now, there is only a handful of orgs that voluntarily make their tax filings available on their sites, and only Food and Friends willingly does so in a timely fashion. When was the last time you demanded your favorite gay or AIDS non-profit post their three most current tax filings on their site? Finally, I wish to thank San Francisco Supervisor Bevan Dufty, his staffers Todd David and Alex Randolph, for their help with this transparency effort. With so many placards, stickers and buttons vying for voters' attention this election season for everything from the gubernatorial and municipal supervisors' races, to the dozens of state and local ballot propositions, an image and slogan must radically stand out to capture a voter's eyeballs. I like the unique way it adapts the winning "Yes We Can" mantra of the Obama campaign in 2008, and incorporates the message to promote passage of Prop 19. And how cool is it that a pot leaf is on top of the message, and it's all printed on green material? This ballot initiative would legalize marijuana use in California for recreational purposes, and should also generate millions of dollars in much-needed tax revenue for the state. Click here for the official Yes on Prop 19 campaign, and remember to, uh, uh, vote dude! Always on the prowl for ways to dupe naive gays into parting with their money, in the ludicrous belief that doing so abets solving any of the problems facing gay people, the Human Rights Campaign is offering a plastic bracelet for $3, ostensibly to do something about bullying and gay kids committing suicide. Too many young lives have been lost because of anti-gay bullying. LGBT youth need to know they're not alone, and that things do get better. 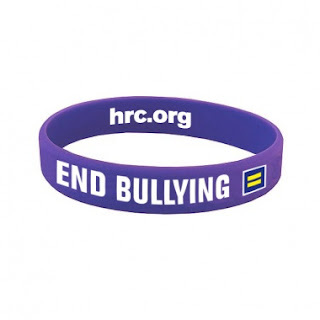 Wear HRC’s purple End Bullying Wristband purple to remember those we've lost and show your support for a world where diversity is embraced, not ridiculed. 100% OF YOUR PURCHASE of the HRC End Bullying Wristband goes to HRC's fight for lesbian, gay, bisexual and transgender equality. Yep, you can waste a few bucks supporting healthy six-figure salaries at this Democratic org, because buying this piece of plastic isn't going to do a damn worthy thing to help at-risk gay and questioning teens. As with the political outcomes of the ego-indulging march on DC last October called for by Cleve Jone, which were nil, very little of lasting value will come out of the profit of the event. The fiscal sponsor of Cleve-Apalooza, the San Francisco-based Tides Center, today announced the names of the three orgs that will receive a portion of the profit. In keeping with the lack of sunshine and community engagement leading up to the DC march, the Tide Center held no open forums to allow for public input into who would get the leftover funds and how they would be used. The first recipient will send gay youth to the worthless and movement neutering annual Creating Change conference put on the National Gay and Lesbian Task Force. Remember how the leaders of the now-useless Join the Impact went to the conference and then grassrootsy street protest org devolved into a tame and lame ego-trip for the founders? If you've heard of anything good coming from Creating Change, lemme know. Second to receive funds are the robustly-compensated co-directors of the GETEQUAL org, which is still struggling for relevancy and a constituency. The third org getting some funding is an org I've never heard of till tonight, Face Value. It's another niche gay org, with a board of advisers comprised of academics, and the director, was the Northern California campaign manager for the No on 8 effort. Can we talk about that massive failure, which didn't cause a single gay leader to lose his or her job? Check out the vague purpose of the org: It is focused on deconstructing the discrimination that LGBT individuals face as roadblocks to equality in their daily lives. I again wish to thank local gay attorney Stephen Zollman for performing an admirable job of holding the fiscal sponsor of Cleve-Apalooza to account, a year after the march. If only we could clone Zollman and get them work at gay and straight press or blogs, because we desperately more such folks serving as watchdogs. Through a fair and inclusive process, we decided to distribute the funding that was left in the Equality Across America project fund at Tides Center to the following three organizations supporting youth leadership, advocacy, and research and education. Unlike scholarship opportunities available to youth based on grade point averages or written essays, Colin Higgins Foundation looks to communities across the country to nominate [gay youth ...] Youth Courage Award recipients receive a grant of $10,000 and will be honored at The Trevor Project Gala in New York City. [...] The awardees will also receive a scholarship to attend the National Conference on LGBT Equality: Creating Change presented by the National Gay and Lesbian Taskforce [sic] in February. Because focusing solely on winning political rights has not led to social equality for LGBT people, the mission of the Face Value Campaign is to eliminate the persistent social stigma against LGBT children and adults by applying thoughtful research methods, traditional and new campaign tools, and collaborative organizing techniques to a deliberate public education campaign that takes place outside the narrow timelines of electoral cycles and the narrow focus of specific LGBT issues. Progressive gay activists interested in holding elected Democratic officials who happen to be lesbian or gay accountable staged a protest last night in Manhattan. They were there to remind folks going into a fundraiser that the Speaker of the New York City Council is a corrupt politician. 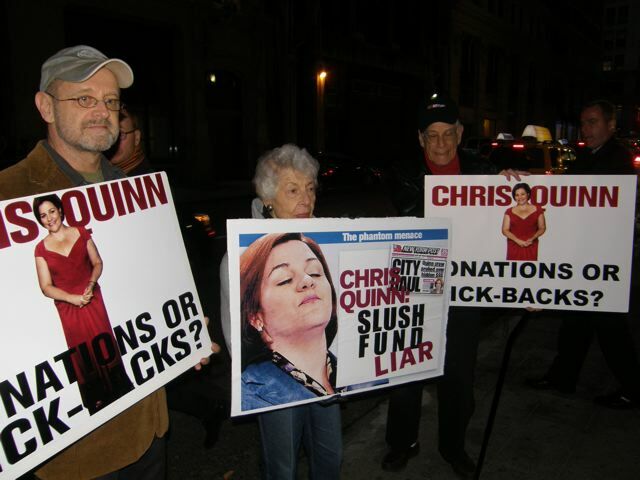 Click here for some background on a few of the citizen's complaints leveled against Quinn over the years. Here's a report on the protest, written by one of the organizers Donny Moss, who also shared with me a few photos. Keep up the great accountability, Donny and company. We gays need much more such campaigns to hold the Democratic Party gay to account for their ineptness and corruption. On October 18, twenty New Yorkers held a protest against Christine Quinn at the Anti-Violence Project gala at the Prince George Ballroom on 27th and 5th (see pictures below). Quinn was an honorary chair of the event. In a bit of irony, a guest of the gala attacked one of the people distributing handouts at the entrance. This person must have momentarily forgotten that she was attending an anti-violence event. Lucky for us, two police officers were standing 15 feet away. Among the many LGBT luminaries who stopped to look at our signs and take our information were NYS Senator Tom Duane and Lambda Legal Defense Fund Executive Director Kevin Cathcart. Guests and passers-by appeared to be intrigued by the protest and wanted to learn more about why we were there. While most of the guests took our handout as they entered the venue, a couple dozen chose not to. But we still had the chance to convey our messages to them by chanting loudly enough so that everyone in the reception area could hear us: "DEMOCRACY IS NOT FOR SALE. CHRISTINE QUINN SHOULD BE IN JAIL." 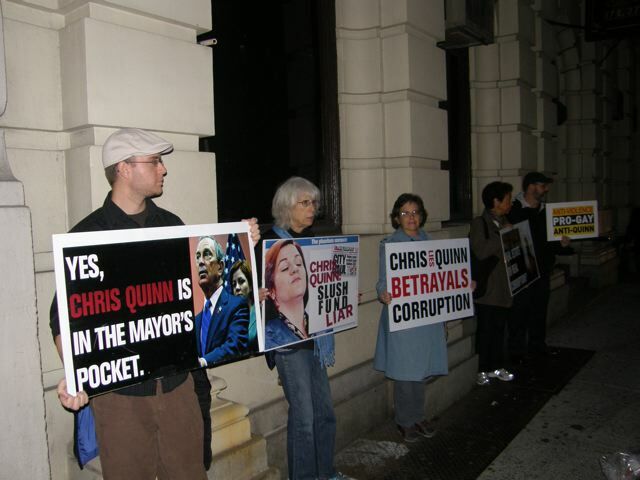 Stay tuned for the report and photos from our next protest against Christine Quinn. 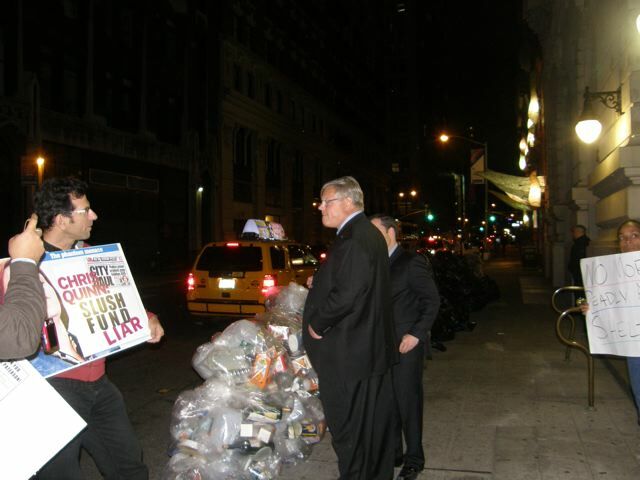 NY State Senator Tom Duane, center, looks at the protesters and their signs. HRC's 2010 IRS Filing Open for Inspection But . . . According to federal law, all nonprofits that file IRS 990 reports must make the most current filing available for public inspection on the day the org accepts their accountant's tax report for the last fiscal year. This year, instead of waiting for certain gay or AIDS orgs to file their IRS 990 forms, then send it to the IRS, and wait for the feds to provide the filing to the GuideStar.org site, I contacted the orgs directly for the filings. The top executives and financial officers at the National Gay and Lesbian Task Force, the Gay and Lesbian Alliance Against Defamation, and DC's Food & Friends are all familiar with the IRS statutes that require them to promptly comply with written requests for a copy of the newest 990, the day they sign off on the filing. For the Human Rights Campaign, it is consistent with its filing date. Their IRS 990 filing for 2007 was available on Aug 15, while for 2008 and 2009 the acceptance date was August 13. All were endorsed by the org's treasurer, James Rinefierd. OTOH, there's also the HRC Foundation's separate IRS filings and the pattern is the same. The 990s for HRCF in 2007, 2008, and 2009, show Rinefierd signed off on the lot. On Friday I emailed HRC's Rinefierd, along with other senior executives, requesting their 2010 tax report to the IRS. I also had a brief phone with him and he promised to get back to me. Rinefierd didn't, but on Monday a deputy press rep for the org, Paul Guequierre, sent a note asking for my fax number so he could transmit the filing. Since I don't have a fax machine, I wrote back request that HRC convert the 2010 filing into a PDF, along with the new IRS 990 for the HRC Foundation. Further, I suggested that HRC post the IRS 990s on their site, as GLAAD and Food & Friends have done. So far, no reply from HRC, no filings emailed to me and the 990s are not on their site. IRS statutes mandate that non-profits must make their 990s available for public inspection and that sharing them on an org's site would meet this legal obligation. It would be very laudable of HRC to not only immediately post their 2010 filing, in addition to the two previous years' filings, but they could go a step further in providing fiscal transparency to the community and make an announcement about the IRS 990 being available. Did Joe Solmonese and other executives receive raises? How much are they being compensated this year? What was the revenue stream? What were the expense breakdowns by program and function? These, and other questions will be answered when HRC widely shares their latest IRS filings. HRC should stop dragging its feet on this important matter of transparency and accountability. Rick Jacobs Inc's Oct '09 WH Meeting? The California-based fiefdom known as the Courage Campaign, founded and operated at the sole discretion of Rick Jacobs, is one more murky Gay Inc entity in which there is no genuine democratic engagement with the community. Jacobs, who once served as a vice president of Occidental Petroleum, hardy a corporation known for developing grassroots gay organizers, has an extensive portfolio of profit-making endeavors leading me to label him Rick Jacobs Inc. The CC is his plaything for dabbling in progressive politics, remember his org is not gay-specific, and he's another leader not known for holding town hall forums. He prefers leadership where he alone is in charge of the hierarchy he controls. His FEC file shows tens of thousands of dollars to (surprise!) Democratic candidates and PACs. None of his donations list him as the executive director of CC. Nope, he's IDed variously as investor, self-employed, consultant, or as with the RDJ Strategic Advisers. Those initials stand for Richard D. Jacobs. Do not for a single moment ever think that Rick is ever really about anything other than, well, Rick. A few months back, I searched the White House visitor logs for his name, found one listing that could be him, but because no ID info or home city is listed, I wasn't sure it was him, so I emailed him, asking if this was indeed him. Never heard back from him. Who is this Zients fellow? At the time of his meeting with Jacobs, he was Obama's director of U.S. Chief Performance Officer. In July, he was made acting director of the Office of Management and Budget. He has nothing whatsoever to do with gay issues. But in the week leading up to Cleve-Apalooza last October, CC's Jacobs was meeting with Zients, and I doubt that the subject had anything of substance or relevance to the gay struggle at the federal level. My hunch is that Jacobs, looking out for his business interests, used his White House access to meet with the chief performance guy for America. If there was another Richard D. Jacobs who met with Zients on October 7, 2009, lemme know and I'll amend this post. Regardless of that White House meeting, I want to point out that Jacobs, without a single public meeting with the 600,000 members of CC, recently aligned hundred of thousands of gays and allies with the Human Rights Campaign. [HRC and CC's] NOM Exposed is one of the most extensive takedowns of the enemies of the LGBT movement that I've seen on the web yet, and I've only just begun to dig in. Take note of the site's "Rogue's Gallery" and start from there. This is fantastic. What's so damn fantastic about letting the Democrats off the hook, for the 6,549th time, Joe? It makes sense that Jacobs, who as his FEC file abundantly shows loves to write big checks to Democratic Party folks of all sorts, and who has not used CC to back the grassrootsy blogger effort to close down the gAyTm, is collaborating with Joe Solmonese, another gay leader who abhors town halls but rushes to write checks to Democrats. Nice that HRC and CC do nothing this election season to hold the DNC accountable. And when the two gay orgs filed an IRS complaint over NOM last week, another diversionary ploy benefiting Democrats, Jervis gave the development big space on his blog, without any criticism or larger context. It's bad enough we have oily Jacobs and slimy Solmonese driving the gay movement ever deeper into the Democratic ditch, do we also need bloggers such as Jervis gushing over this sorry state of gay affairs? No communication for months...if it is defunct...how is Tides wrapping up this fiscal project and accounting for the now less than 100,000 that was raised? We’ve engaged all interested parties to determine the final resolution of EAA, through conference calls, several follow-up calls and emails with those who continued to engage us from the ENOT board and previous board members. As you know, EAA came to Tides as a march and after that was completed, the future focus became unclear. Tides waited for clarity and leadership to evolve, encouraged collaboration among those remaining interested, and finally, based on the information we gathered, concluded that there isn’t sufficient collective leadership or a clear mission focus. Tides Center will disburse the remaining funding according to IRS regulations, and to serve causes aligned with Equality Across America. The web site for EAA looks like it hasn't been updated since May and there is no listing of any directors or board members associated with the group. At this point, one year after Cleve-Apalooza indulged the massive ego of a single gay leader, and not much benefit came back to the larger gay community, I'd sure like to see some genuine follow up to the mess of the October 2009 event. Has anyone asked Cleve what came of his big schemes? Why did the EAA org fall apart? Whose responsibility was it to properly disburse the left over money, which I understand is between $90,000 and $100,000? Should we ever go along with another corrupt effort that doesn't lead to lasting change or a viable network of activists? I'd sure like to hear from all the Gay Inc entities, political leaders, and Cleve groupies such as Robin McGehee and Kip Williams, about what exactly went wrong with their plans for a collective of 435 district captains in every Congressional district. The extreme lack of democratic engagement on the part of Gay Inc continues, at a time when one increasingly irrelevant org has plenty of staffers, board members and resources to put on useless award shows and other galas, and now, a reception at a fancy clothing shop. While the leader of the free world, Barack Obama, held another forum in a regular series of town halls last week in which audience members questioned him directly on gay issues, and our Secretary of State conducted her latest Q&A session with reporters and civic leaders in Kosovo, and a gay matter was raised, I must again wonder why so few gay voices demand that our professional advocacy orgs follow the examples set by Obama and Hillary Clinton. If those two American leaders can put on regular town halls, HRC and GLAAD and NGLTF and Equality California and GETEQUAL and every other Gay Inc org should be able to do the same, pronto. This news nugget about how GLAAD is able to arrange a shopping and cocktail event in San Francisco, is just more elitism. The nugget comes via the SF Bay Times and its writer Dennis McMillian. Lemme state that I basically like the paper, its publisher Kim Corsaro, and Dennis, and really look forward to whatever Ann Rostow has to say in her columns, but the story with the nugget is just a barely recycled press release from GLAAD. That is terribly disappointing and Bay Times and Dennis would be serve the community if they didn't server as stenographers for GLAAD or any other Gay Inc entity. GLAAD held a cocktail party in Brooks Brothers clothiers on Sept. 29 with Juan Barajas, senior director of San Francisco, giving the latest information on the Alliance’s progress. Brooks Brothers’ manager, George Longoria, made the evening possible, with any purchase giving 10% to GLAAD. GE paid staffer Jay Carmona was fired on the spot after not bringing numbers to an action, but Carmona reportedly told Robin that the attendance targets were not within the realm of reality long before the event. "Living Wage" Robin didn't seem to care, because she fired someone who had moved to DC for the job with no warning, no severance, etc. etc. Some GetEQUAL co-directors are more equal than others, and clearly McGreedy, so named for her ravenous ambitions and decision-making piggishness, is the chief equalizer of this org. Since the source for the above nugget prefers anonymity, I asked a second link to GE to weigh-in on the news, so I sent a note to Geoff Millard. He's the gay Iraqi war vet who's now against the war and was engaged with Jay and GE when they staged an emergency rally at the White House over DADT. Click here for background. That's the story. That and most of us will not work with them now. The GE site's page for the staff no longer includes Jay's visage and bio sketch, and no explanation is shared with the community as to why she is no longer employed at the Astroturf org. If she's not too busy renting a yacht in Miami Beach, maybe Robin can shed some light on Jay's firing. Would ENDA have protected Jay from being fired and treated like yesterday's trash, if it were on the books and under full enforcement? This essay is about the corrupt partisanship of the Human Rights Campaign, but allow me to tout my own horn for a moment. According to writer Jon Ward at the Daily Caller political site, I was the first to raise the issue of outrage over senior Democratic White House adviser Valerie Jarrett using the phrase "lifestyle choice" in an interview about recent gay teens bullied into suicide. Sure, it's gratifying to get some recognition, but it's even more smile-inducing watching the ripples from my blog post help deliver an apology from Jarrett and then watch the issue bubble up to President Barack Obama having to address the choice question at his MTV town hall on Thursday night. Plus, this "nature versus nurture" story seems to have some muscular legs. On Wednesday when Jarrett's comments roiled the gay community and progressive bloggers, thousands of words were spilled from all sides about her remarks, but America's largest gay Democratic advocacy org, the HRC, had not a peep to say about it all. Of course, no sane person would expect HRC, after slavishly avoiding even the mildest and meekest bit of criticism against the Obama administration's screwing of the gay community without a rubber or any lube, to issue a rebuke to Jarrett. She is after all, a Democrat and HRC executives would rather walk barefoot on glass than slam a Democrat. Colorado Republican U.S. Senate candidate Ken Buck looked surprised and uncomfortable when asked Sunday whether homosexuality is a choice or not. But nonetheless, he said he thought it was. Sure, this is several degrees stronger than the incredibly poor, um, choice of words by Jarrett on Wednesday, a normal business day, but for me, the basic issue is the same: a top Democrat or GOP operative or pol is expressing the lie that sexual orientation is a decision one makes, like whether to wear a blue or green shirt one day. HRC used more than 400 words to condemn Buck, and I'm pleased they did so, but they also should be spanked for failing to hold Jarrett to the same standard. If HRC expended even a single sentence over the Jarrett comment, I'm unaware of it. This is just the latest example of HRC proving what good Democratic Party lapdogs they truly are. Since at least 1998, the editors and reporters at the Bay Area Reporter have performed a tremendous service to the local community when they write about the budgets and salaries of gay and AIDS orgs. When new executives are hired or old ones leave, the BAR notes their pay level, and it is common for the paper to report on an org's annual revenue and expenses, as listed on the group's IRS 990 tax filing. Unfortunately, such exemplary accountability reporting is not standard practice at other gay newspapers and lots of gay bloggers ignore compensation and budgetary matters, as part of their routine coverage. As has been reported, GetEqual's start up funds came from Jonathan Lewis, the son of one of the founders of the Progressive auto insurance group. He has provided most of the money that has kept GetEqual going since it started in March. In a phone interview, Cronk estimated Lewis had contributed $400,000, "certainly no more than $440,000." Lewis couldn't be reached for comment. GetEqual's budget is around $500,000 this year. Cronk said that money comes from a combination of Lewis's initial grant, and what they've raised online. Cronk said the group doesn't break down its expenses by how much it spends on things like airfare. Instead, they're separated by program or action. During a recent interview, she didn't have immediate access to the information and said, "I wouldn't want to publish that in the paper." "That's not the story of what we're doing," she explained. Cronk said no donor has asked for an expense breakdown. She wouldn't comment on whether such information would be provided if someone did ask for it. "It feels a little bit like you're trying to trap me in something," she said. Whoa, a gay reporter for San Francisco's leading paper is simply attempting to bring some fiscal transparency to this org, and the co-director gets all paranoid. Cronk's way of thinking, "hide the info from the community," is right out of the GLAAD playbook regarding its tortured refusal to release the executive director Jarrett Barrios' compensation info. Click here for the BAR story on that bit of GLAAD non-transparency. In an e-mail, Cronk also said, "We will do everything we need to do in order to be in compliance with the IRS," which requires tax-exempt groups like GetEqual to disclose expense data. The BAR mentioned that Cronk previously worked for a progressive training outfit in Washington called the New Organizing Institute, and GetEQUAL's site notes that Williams attended sessions there. More than four months ago, I contacted NOI's executive director Judith Freeman because her org's site provides no fiscal transparency whatsoever. Nothing about salaries, budgets or expenses, and the org's IRS 990s are neither posted on their site not linked to at the GuideStar site. We can't currently edit those pages on our website because we are in the middle of getting the IRS determination letters, and they can't be different then the pages we had to get the lawyers to write the text for and (believe it or not!) PRINT OUT and postal mail to the IRS. So far, not a single IRS 990 filing has been shared by Freeman. Seeing how NOI is great at mouthing flowery speech about transparency and accountability, and not delivering, I believe they set a lousy model that is now being followed by Cronk and GetEQUAL.